Maid of Gingerbread is run by Emily Garland, a food artist specialising in 3D biscuit building. She produces everything by hand in her gingerbread studio-kitchen in Hackney, East London. 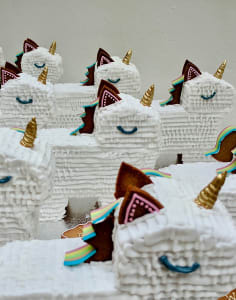 Drawing on years of baking experience and a passion for woodwork and construction, she founded Maid of Gingerbread in 2010 and has since produced show-stopping edible centrepieces for a wide range of clients including Zizzi, D&AD, Harrods and Fortnum & Mason. She has become known for her original, modern designs and intricate details, always incorporating a sense of fun and colour into her work and now runs workshops and produces baking kits so that others can learn her style of biscuit building. In her workshops you will learn modern techniques for constructing and decorating 3D biscuit creations (of a variety of different flavours, not just gingerbread). Emily believes that experimenting with baking is fun for everyone, not just kids, and loves working with people to bring out their creativity in the kitchen. If you have any questions, please use the ‘contact host’ button.